Reduces unsightly stains and fat deposits. 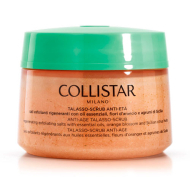 DESCRIPTION: Reshaping Mud-Scrub from Collistar is a modeling and firming treatment. A single product: the effectiveness of a mud rich in active ingredients, an action located in the most critical areas, the soothing effect of an exfoliant and the convenience of a bath treatment. To ensure effective action even in the most critical areas (arms, abdomen, legs and buttocks), is formulated with a concentrated fusion of plant extracts, Algae, Sea Salts, Essential Oils and Clay combined with the Thermal Water of Salsomaggiore Terme. Its effects are potentiated by osmotic energy that favors the mud fluid drainage and optimizes the action of the remaining ingredients. Spread the mud the areas to be treated. 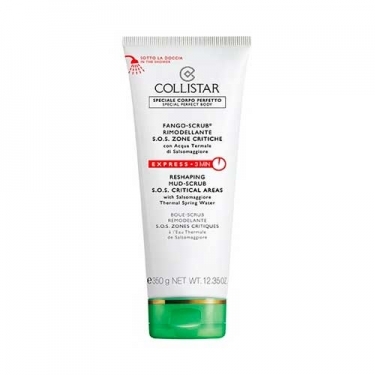 Ideal for skin with cellulite.